Come June and the MIT World Peace University was all geared up for the new batch to take on the academic session 2017-18. Like every year it was a fantastic affair planned by the staff and students, a successful joint effort. On 5th July, 2017 at 10.00 a.m we had students enthusiastically lining up along with eager parents to walk the steps of Swami Vivekananda Hall. An hour later a pack audience, both parents and wards waited for the ceremonious morning. 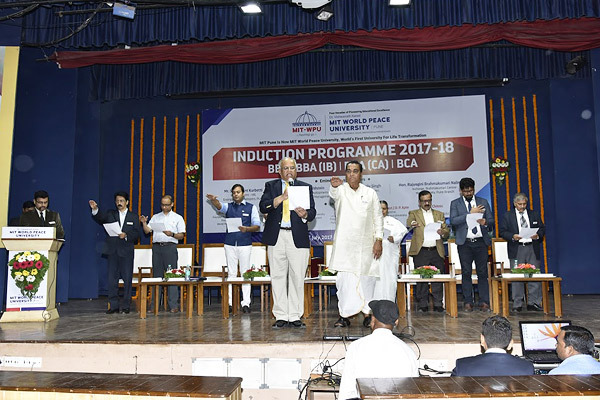 The programme was divided into two parts, the first a formal part followed by the informal event. 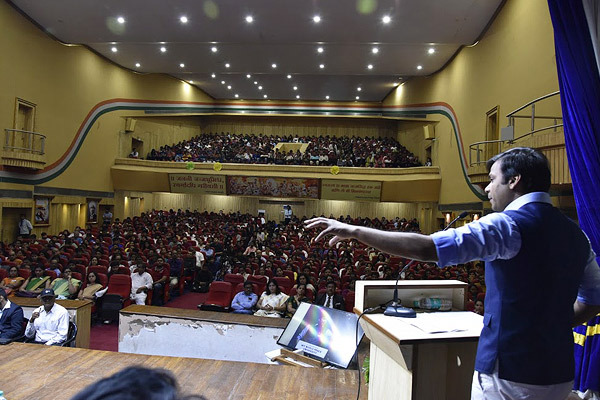 The books like Know Your India and Autobiographies of Steve Jobs and Mahatma Gandhi- My Experiments With Truth were distributed to the students along with bag. We had been fortunate enough to be backed by Hon. Prof. Dr. V.D. 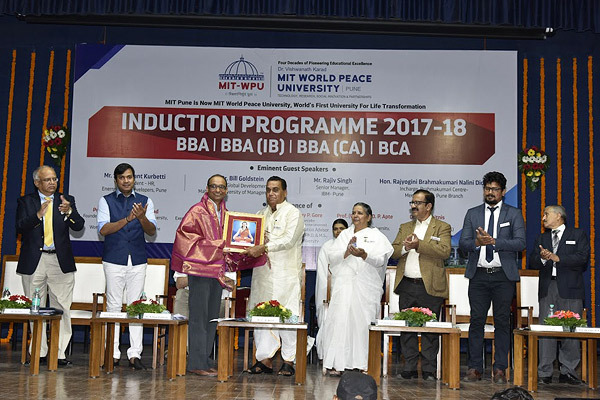 Karad –President, MIT World Peace University, Pune, Hon. Mr. Rahul V. Karad- Executive President, MIT World Peace University, Pune, Prof. Dr. Jay Gore – Interim-Vice Chancellor, MIT World Peace University, Pune, Prof. (Gr. Capt.) 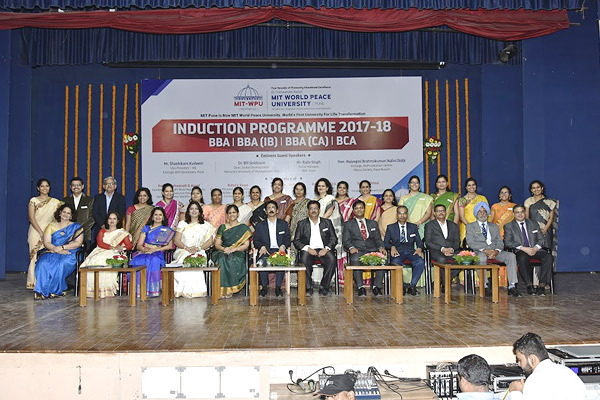 D. P. Apte – Registrar, MIT World Peace University, Pune who were present for the Induction Programmme along with the guests Hon. 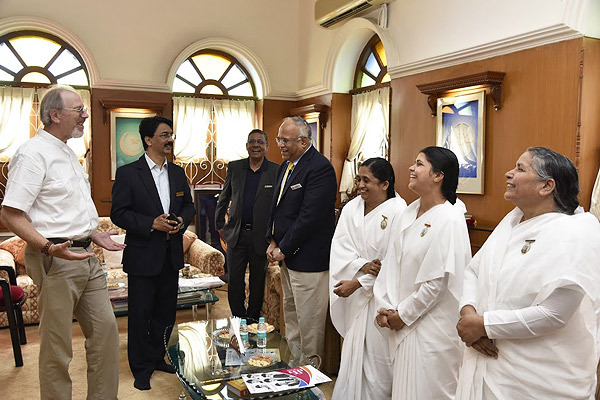 Rajyogini Brahmakumari Nalini Didiji, Incharge, Brahmakumari Centre, Dr. William Goldstein, Dean, Global Development- Maharishi University of Management, USA, Mr. Shashikant Kurbetti, Vice President - HR, Enerrgia SKYi Developers, Pune, Mr. Rajiv Singh, Senior Manager, IBM- Pune and Dr. R. M. Chitnis , Dean- Faculty of Management (UG), MIT World Peace University, Pune, took the dais on sharp 11.00 a.m. and the anchor Prof. Gautam Bapat took on the proceedings to welcome the new entrants and the parents. The World Peace Prayer illuminated the hall to give a perfect glow. Life was brought in by Dr. R. M. Chitnis with his encouraging and powerful speech bringing instant applause from the students and parents. No stone was left unturned with perfect detailing. Hon. Prof. Dr. V.D. 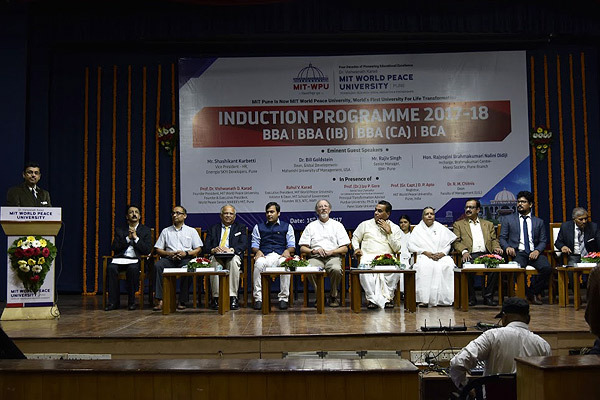 Karad –President, MIT World Peace University, Pune, Hon. Mr. Rahul V. Karad- Executive President, MIT World Peace University, Pune, Prof. Dr. Jay Gore – Interim-Vice Chancellor, MIT World Peace University, Pune and Prof. (Gr. Capt.) 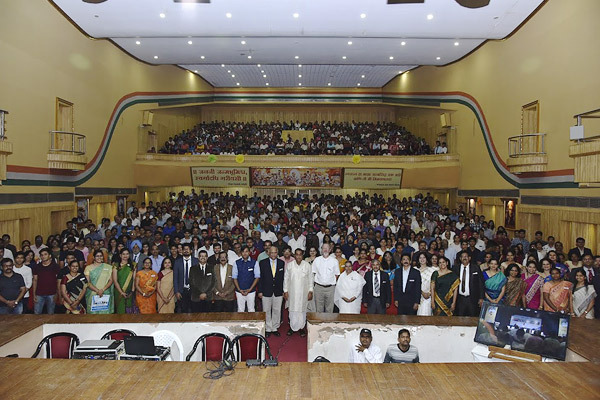 D. P. Apte – Registrar, MIT World Peace University, Pune addressed the gathering with motivational and inspirational words. Our Guests had wonderful words and citations to give the extra boost to the new entrants, who looked a bit dazed but were put at complete ease by them. They also motivated the new entrants to explore the opportunities which they get in the college life. The Guest with their words of wisdom, asked the students to urge themselves a little more than the usual to come out as complete winners. Hon.Prof. 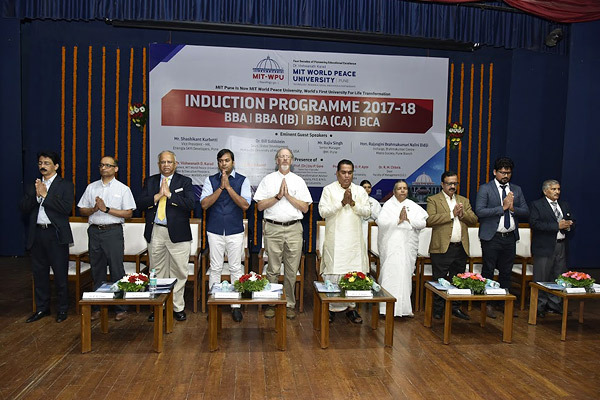 Dr. Jay Gore – Interim-Vice Chancellor, MIT World Peace University, Pune gave the Oath of Discipline at MIT World Peace University. With this the first part of the programme ended with Pasaydan. 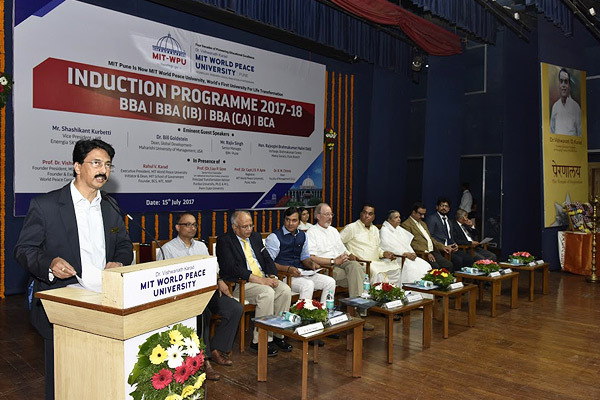 The second part of the programme brought Dr. R. M. Chitnis to give in the rules and regulations of MIT World Peace University and what are the expectations out of the students and the staff. The clipping of International Summer Schools attended by our students was presented to the gathering which was followed by certificate distribution to the students and faculty members of International Summer Schools. The programme came to an end with the teaching and non teaching staff introducing themselves. This broke the final ice between the students and the staff. 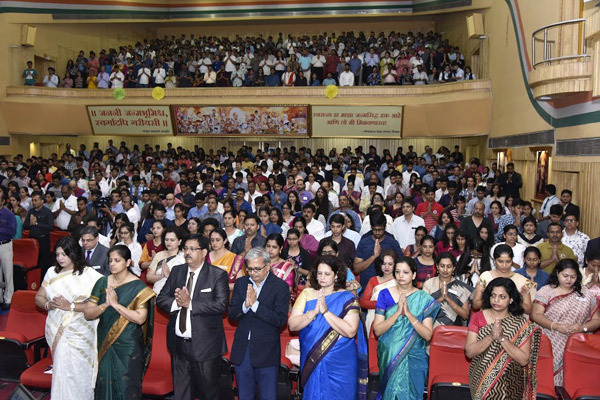 The highlight of the ceremony being the turnout of the parents in fantastic numbers, increasing their belief in the college.